QOMO’s QWB infrared series interactive whiteboards have changed the way educators engage students and present dynamic curriculum. 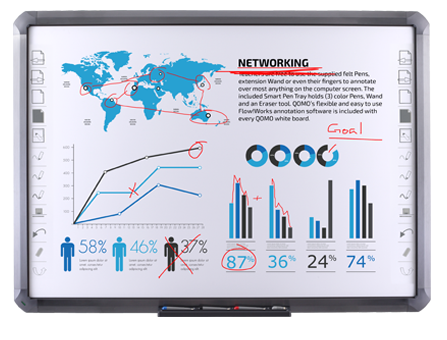 QOMO engineers have harnessed advanced technology to make the QWB infrared whiteboard series simple, reliable, powerful, and affordable. Up to 10 people can interact with the board at once. Shortcuts located on either side of the board will streamline your presentations. A surface that’s durable and built to last. Annotate over anything with a finger or a pen.